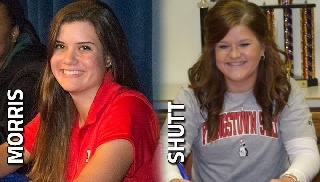 Youngstown State women's golf coach Nate Miklos announced the signing of Reva Morris of Notre Dame Cathedral Latin and Katlyn Shutt of Dover to National Letters of Intent. Morris and Shutt will join the program starting in 2016-17. Shutt was a first-team Division I All-Ohio selection as a senior. She carded a two-round 151 (78-83) in her first appearance at the Division I state meet. Shutt was named the Eastern District Player of the Year after averaging 75.1 strokes per round this past fall. She finished fourth at the Division II Ohio Championships as junior with a two-round 148 (73-75). Dover won the state championship by nine shots over Cortland Lakeview. As a sophomore, she tied for seventh with a 155 (77-78) as Dover finished second in the team race. Katlyn's older sister Courtney is a sophomore for the Penguins. Morris was a second-team Division I All-Ohio selection as senior. She carded a two-round 153 (79-74) in her first appearance at the Division I state meet. During her senior campaign she won five tournaments and was the North Coast League MVP while averaging 76.5 strokes per round. As a junior, she was sixth at the Division II state championships with a 150 (72-78) helping lead Chardon Notre Dame Cathedral Latin to a third-place team finish. As a sophomore she was fourth with a 152 (75-77).